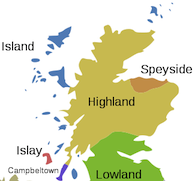 You are here: Home / Fettercairn / Fettercairn Distillery Announce Re-launch & Release Of Four New Expressions! Fettercairn Distillery Announce Re-launch & Release Of Four New Expressions! Fettercairn Distillery proudly announce the global re-launch of their premium Highland Single Malt whisky with the release of four new expressions. Reflective of the distillery’s unique production method and befitting of its stock of rare and aged whiskies the exceptionally refined new range of single malts is a must try for all whisky connoisseurs. Located in the picturesque village of Fettercairn at the foothills of Scotland’s Cairngorm Mountains, this hidden gem is found among some of the finest and most fertile farming land in the North East of Scotland. With the purest of mountain water as an ingredient, it is almost no surprise that when the distillery was established by Sir Alexander Ramsay in 1824, the enterprising pioneer chose this location. In the mid-1950s, the whisky-makers at Fettercairn experimented, seeking ways to create a purer expression of their spirit. They found that pouring water down the still cooled the copper, increasing condensation inside so only the lightest vapours could rise for collection. With this knowledge they fashioned a unique copper cooling ring around the neck of the stills drenching them with crystal clear mountain water – an ingenious and practical solution to creating their exceptional whisky, a technique which remains unique in Scotch whisky-making to this day. 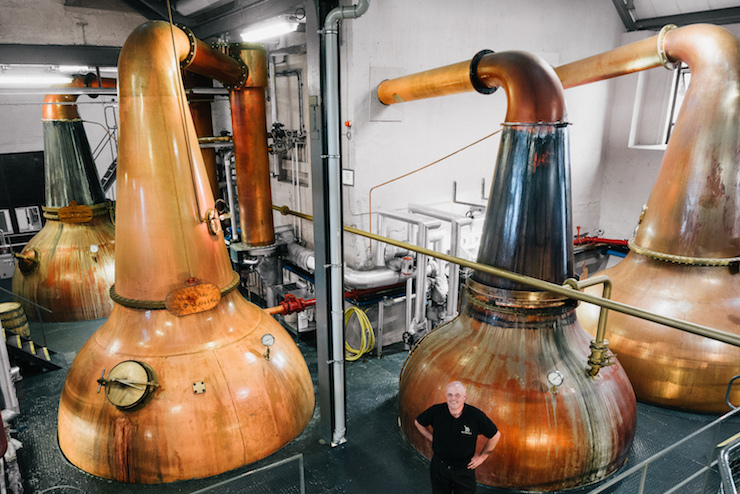 Not only beautiful to watch and a highlight of the distillery’s breath-taking still house, the technique creates a striking oxidation ‘patina’ on its copper, with colours of teal, white and brushed copper making the stills at Fettercairn a spectacle in their own right. 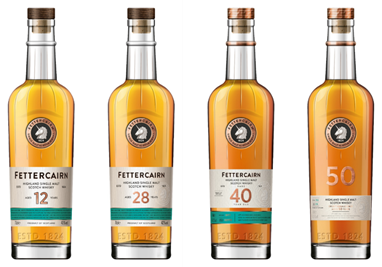 Featuring four new expressions, the new Fettercairn range boasts a house style of tropical fruits, soft spice and sweetness – showcased in melon, pineapple, banana, clove, ginger, treacle, toffee and caramel. We start with Fettercairn 12 Year Old priced at £48 RSP, followed by the 28 Year Old; at the top of the range the 40 Year Old and 50 Year Old, with the latter retailing at RSP £10,000 and both non-chill filtered and natural colour. Already award-winning, Fettercairn 28 Year Old was presented with Gold at IWSC 2018, and the 40 Year Old Gold awards at ISC 2018 & IWSC 2018. Each product in the range begins its life in American White Oak ex-bourbon barrels with the 12 and 28 Year Old expressions resting here until maturity, while the 40 Year Old features a finish in an Apostoles Sherry Cask (no. 6) and the 50 Year Old in a Tawny Port Pipe (no.1). The progression of age and finishing designed to take drinkers on a journey of elegant, tropical fruit flavour intensity. Indicative of its history, the brand logo has been refreshed to hero the Ramsay Clan unicorn and nod to the copper cooling ring, while each new expression is presented in stylish new bottle and pack designs that feature oxidised copper. The 40 Year Old and 50 Year Old are presented in hand-crafted wooden presentation boxes to reflect their value and prestige. Fettercairn is simply a beautiful distillery with a treasure trove of aged and rare stocks. I’ve worked here since 1990 and most of the team that started with me then are still on this journey with me today. It’s a pleasure crafting Fettercairn Single Malt together and we are immensely excited to finally share our exceptional whiskies with enthusiasts the world over. Fettercairn 12 Year Old and 28 Year Old is available from all good whisky specialists. Fettercairn 40 Year Old and 50 Year Old will be available late August. Prices range from £48 RSP to £10,000. The Fettercairn Distillery welcomes visitors during the summer months. · Fettercairn 12 Year Old (40% ABV): RSP: £48 / $60. 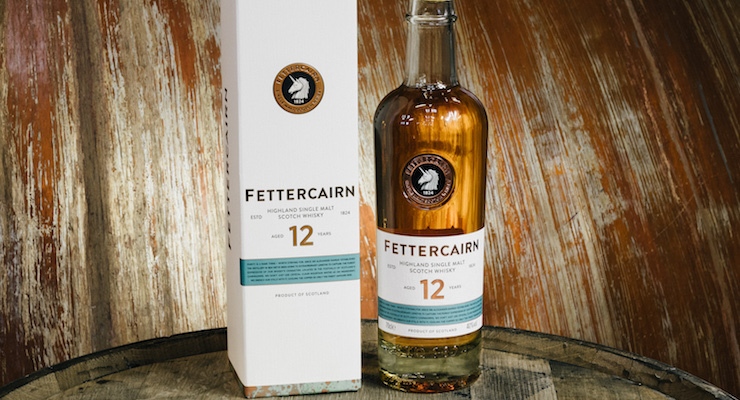 Aged in American White Oak ex-bourbon barrels, Fettercairn 12 Year Old is the colour of sunlight and amber honey, with vanilla, pear and soft spices on the nose and refreshing nectarine, tropical fruit and roasted coffee to taste. To finish, memorable flavours of sultanas and black toffee. 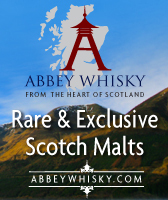 · Fettercairn 28 Year Old (42% ABV): RSP: £500 / $675. Aged in American White Oak ex-bourbon barrels for 28 years, this expression from Fettercairn is deep shimmering gold in colour. With initial bursts of pineapple and melon on the nose before giving way to treacle and banana, and hints of warm ginger and liquorice; this expression opens up to citrus peel and black pepper on first taste, followed by tempered walnuts, coffee, apricot, and a touch of sweet balsamic for a rewarding drinking experience. · Fettercairn 40 Year Old (48.9% ABV): RSP: £3,000 / $4,000. Distilled on 23rd December 1977 and laid to rest in American White Oak ex-bourbon barrels with a finish in an Apostoles Sherry Cask No.6 for a truly dark and intense whisky with dazzling amber highlights. On first nose, honey, molasses, and ginger, then overtaken by toffee apple, thick treacle, and sherry. To taste liquorice and balsamic vinegar, are balanced with citrus, toffee and raisin for a glorious finish of soft spice and tropical fruits. This forty-year old expression is non chill-filtered with no added colour. 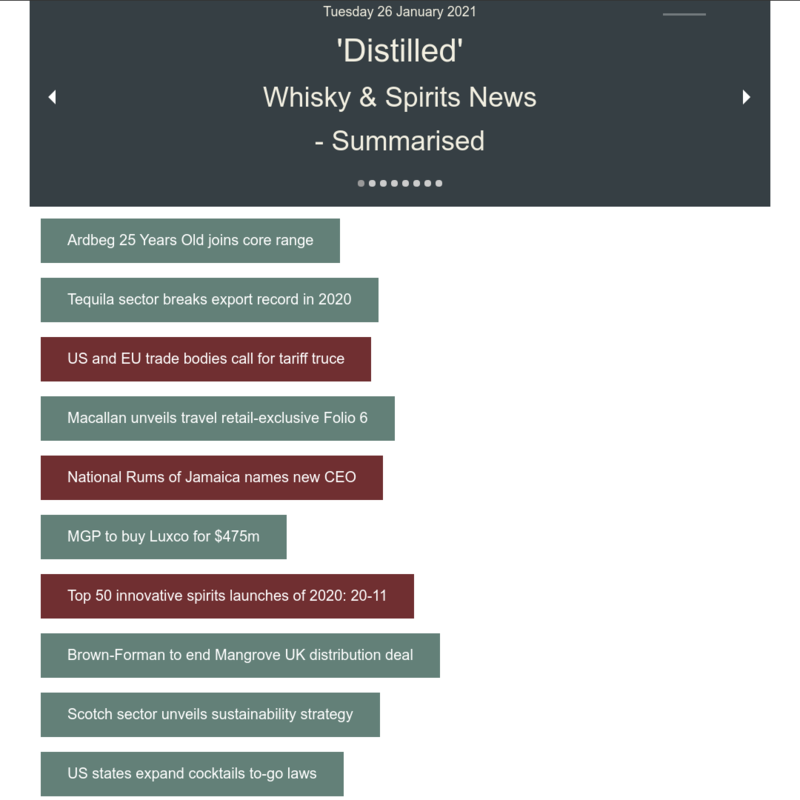 · Fettercairn 50 Year Old (47.9% ABV): RSP: £10,000 / $13,500. Distilled on 11th June 1966 and laid to rest in American White Oak ex-bourbon barrels with a finish in Tawny Port Pipe (Cask No1). This refined single malt showcases a dark and rich colour, like the night enlivened with stars. Enticing aromas begin the drinking experience with ginger, spices, citrus peel, and apple; preceded by nuances of Morello cherry, over-ripe plums, and blackcurrant. A whisper of coconut and a hint of pineapple provide an unforgettable close. To taste warm spiced citrus, ground coffee, and toffee apple, give way to rich notes of port wine and sweet almond; burnt caramel and soft chewy liquorice notes round out this timeless treasure. This fifty-year old expression is non chill-filtered with no added colour.